Compared with other states, Texas ranks number 1 for frequency of tornadoes, number 1 for number of deaths, number 1 for injuries and number 1 for cost of damages. When we compare these statistics to other states by the frequency per square mile, Texas ranks number 10 for the frequency of tornadoes, number 16 for fatalities, number 21 for injuries per area, and number 21 for costs per area based on data from 1950 - 1995. In 1970, Texas had a population of 11,198,655 and between 1950 and 1995 Texas had 5,722 tornadoes. This ranks Texas number 1 in tornadoes by state. The population in 1970 divided by the number of tornadoes equals 1,957. This ranks Texas number 8 in the ratio of tornadoes to population. Texas had 478 fatalities between 1950 and 1995. Compared to other states it ranked 1. The risk of death in any one year is 1 in 1,054,267. This ranks Texas as number 7 for the risk of death by tornadoes . Between 1950 and 1995, Texas had 7,554 injuries involving tornadoes. This ranks Texas number 1 among the United States for injury. The risk of injury in any one year is one in 66,712. When we divide the population by the number of injuries, Texas ranks number 7. The total cost of tornadoes between 1950 and 1995 was $1,986,918,400.00. This ranks Texas number 1. The cost per person for tornadoes in Texas per year is $ 3.94. This ranks Texas number 12 in costs for tornadoes per person . In an average year, 800 tornadoes are reported nationwide, resulting in 80 deaths and over 1,500 injuries. 1. May 11, 1953: A tornado hits Waco, killing 114 people and injuring 597. An estimated 150 homes and 185 other buildings are destroyed. 2. May 18, 1902: A tornado cuts a wide swath through the town of Goliad; 114 are reported killed, 230 injured; 150 buildings are destroyed. 3. April 12, 1927: A twister moves through Edwards, Real and Uvalde counties, killing 74 and injuring 205. Most damage occurs in the town of Rocksprings, where 72 people die. 4. April 9, 1947: One of the largest twisters on record, its path up to a mile wide, hits Carson, Hemphill and Lipscomb counties. Sixty-eight people die, and the town of Glazier is destroyed. 5. April 10, 1979: Forty-two people are killed and more than 1,700 injured by a tornado in Wichita Falls. More than 3,000 homes are destroyed and 20,000 people left homeless. 6. April 9, 1919: A tornado moves through Henderson, Van Zandt, Wood, Camp and Red River counties, killing 42 people and injuring 150. On the same day, a tornado in Fannin County kills 20 people and injures 45. 7. May 6, 1930: Hill, Ellis and Navarro counties are struck by a tornado that kills 41 people. On the same day, 36 people die as another twister sweeps Karnes and DeWitt counties. 8. May 22, 1987: A tornado hits the small West Texas town of Saragosa during a kindergarten graduation ceremony, flattening the community center and church, killing 30 people and injuring more than 100. 9. May 27, 1997: A twister hits Jarrell in Central Texas, killing 30. Two other deaths from other storms are confirmed in nearby Travis County. 10. May 11, 1970: A twister in Lubbock kills 28 and injures 500. Almost a quarter of the city is damaged. 11. May 30, 1909: A Brown County twister kills 28 people. 12. May 9, 1927: Twenty-eight people die as a tornado hits Collin, Hunt and Lamar counties. 13. May 14, 1923: A Tornado in Howard and Mitchell counties kills 23 and injures 100. Damage: Some damage to chimneys; breaks branches off trees; pushes over shallow-rooted trees; damages sign boards. Damage: The lower limit is the beginning of hurricane wind speed; peels surface off roofs; mobile homes pushed off foundations or overturned; moving autos pushed off the roads; attached garages may be destroyed. Damage: Roofs torn off frame houses; mobile homes demolished; boxcars pushed over; large trees snapped or uprooted; light-object missiles generated. Damage: Roofs and some walls torn off well-constructed houses; trains overturned; most trees in forest uprooted; heavy cars lifted off ground and thrown. Damage: Strong frame houses lifted off foundations and carried considerable distances to disintegrate; automobile-sized missiles fly through the air in excess of 100 meters; trees debarked; steel-reinforced concrete structures badly damaged. Tornadoes never hit major cities: FALSE. Tornadoes have been known to hit major cities. Populated cities such as: St Louis, Missouri; Los Angeles, California; Miami, Florida; Vancouver, Washington; Buffulo, New York; Memphis, Tennessee; and Houston, Texas have been hit by tornados. If you live in a hilly area a tornado will not touch down: FALSE. Tornadoes can touch down in hilly areas, although they may not be as strong. But then tornadoes never follow a particular set of rules. The tornado that hit Topeka, Kansas on June 8th, 1966 was NOT slowed down by high rise structures or hills. Tornadoes do not stay down for more than 3-5 minutes: FALSE. Although tornadoes generally do not stay down long, strong ones have and do. The Andover, Kansas tornado was on the ground for 45-70 minutes. The tri-state county tornado was on the ground for 3 hours. Tornadoes never cross rivers: FALSE. Tornadoes have crossed rivers. A river will NOT stop a tornado from reaching land. The Missouri river has had many cross over without any difficulty. Oregon, Washington, and California never have tornadoes: FALSE. The entire west coast has had tornado activity dating back as far as the 1800's. In 1977 a violent tornado formed acrossed the Columbia River crossing the river and leveling many homes in Vancouver, Washington, killing over 12 people and injuring several others. Tornadoes can strike anywhere in the U.S. Always go to the Southwest corner of your house during a tornado. FALSE. Staying in the Southwest corner of your home will not guarantee safety. Tornadoes can come from ANY direction. The best place to take cover is underground and get underneath a sturdy work bench or table. You can tell if a tornado is going to be violent if the tornado is huge this means it will be very destructive: FALSE. The size of a tornado does not indicate how violent it's going to be. 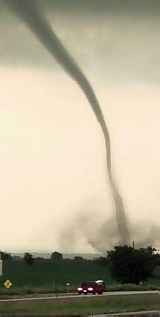 The Jarrell Texas tornado touched down as a small single vortex tornado. However, wind speeds were clocked at over 250mph in that stage. Within a few minutes it became a multiple vortex. This consisted of several multiple vorticies within the tornado itself.Multiple vorticies are 6-8 small tornadoes within the original funnel causing much more damage. Same is true in the case study of the Andover tornado which formed over McConnell AFB as a single vortex tornado, but in it's mature stage of developement became a massive vortex tornado. There is still no way to predict the intensity of a tornado. If there isn't a wall cloud this means there is no possibility for tornadic activity: FALSE. 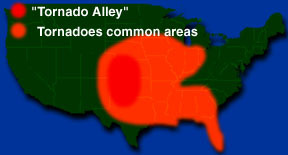 There have been cases where a tornado has formed without the presence of a wall cloud. You can always count on warning sirens: FALSE. Not always, sometimes warning systems can fail due to power loss. If you are under a tornado watch the best thing to do in this situation is keep tuned in to your local weather station via a battery powered radio just in case power does fail. If electricity fails, the fire department and police department usually sound off their sirens to warn of a possible threat in your area. The best thing to do is to keep alert and watch for any threatening storms approaching your area and be prepared to take action. There is no way to survive a tornado: FALSE. If you tune into your local weather station when there is a watch in your area, it is best to prepare yourself for the possibility for tornadic developement. Do not assume that a watch will not become a warning. Take every watch seriously, even if you have never had one in your area. It's always best to be prepared. If a warning has not yet been issued in your area and you see golf ball sized hail and high winds or if you see swirling clouds and debris, take shelter immediately! Do NOT assume anything, respond to the signs. It could very well save your life.